Polyglot’s Renewable Energy and Environmental Manager Liz Floyd, has been a volunteer on the Environment Institute of Australia and New Zealand (EIANZ)- NSW division committee for over 8 years. During this time she has been a key member of the team developing Climate Change Adaptation Professional Development events and now training programs (“Learning to Adapt”). 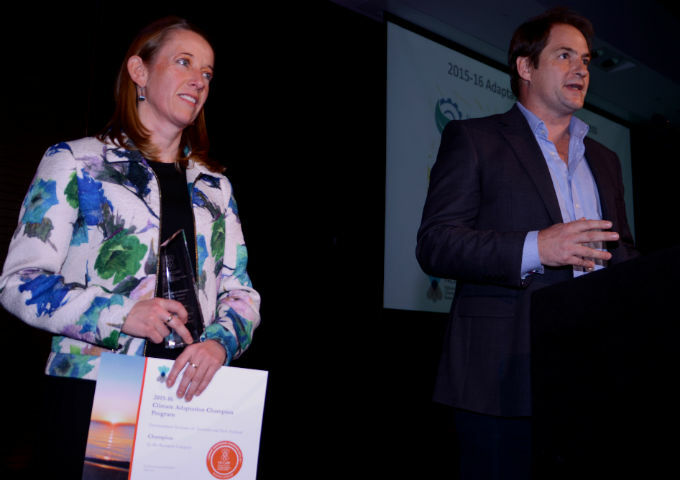 Liz recently attended the NCCARF Climate Change Adaptation Conference in Adelaide along with fellow EIANZ team member Tom Davies and delivery partner – Fabian Sack of Sustainably, to receive the 2015-16 Climate #Adaptation Champions Award – Business Category. Congratulations to EIANZ and to our Liz for being awarded on the amazing work that they do. We are so proud of Liz and all the work that she does for the environment. She is a leader in her field and a true inspiration. EIANZ has been building capacity amongst environmental professionals for more than three decades. With more than 400 participants to date, the Learning to Adapt Program has become the most continuous and longest running course relating to climate change in Australia. & Tom Davies (Chair, EIANZ Climate Change SiS).